asked if she could feature my blog on her blog today! What ???? Are you kidding me???? To say I was thrilled would be an understatement! Thanks so very much Lesley, I was completely touched that you asked! She also has this cute little badge to go along with the honors! Thanks for letting me share my joy with you! I hope you have a fantastic day…….I know I will….. it’s Friday!!! followed by a Halloween project that I can finally share from Die Cut Crazy Magazine! Categories: Other | Tags: Cards, stamping | Permalink. 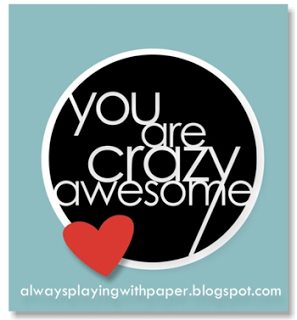 Well, we already knew you were awesome! Have a great weekend, my crafty friend. How fun to get such a nice shout out!! Wow…what an honor! Congratulations Nancy! I’m so happy for you! Thanks soooo much JoAnn….you too!